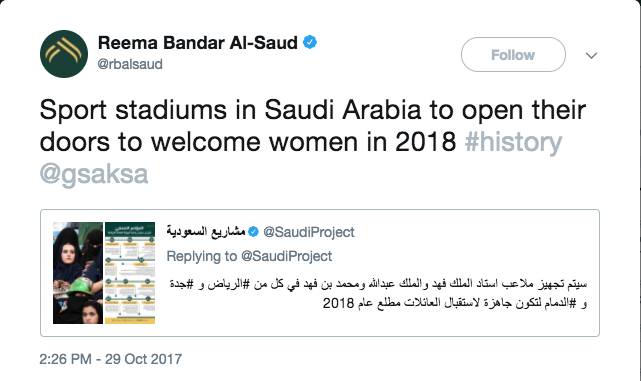 Women in Saudi Arabia can begin attending sporting events starting in 2018. Princess Reema bint Bandar Al-Saud of Saudi Arabia tweeted the announcement Oct. 29 after @SaudiProjects, a Twitter page focused on updates within the kingdom, posted a thread of changes to come within the country this upcoming year. Princess Al-Saud currently acts as the vice president for women’s affairs of the General Sports Authority The Washington Post reports. Stadiums in the major cities of Riyadh, Jiddah and Dammam plan to implement specific seating for women and families. CNN reports these stadiums previously only allowed male attendance. This move comes one month after the country granted women the right to drive starting in June 2018. Crown Prince Mohammed bin Salman, second to the king in Saudi Arabia, wants to create a more modern Saudi Arabia, which includes a step away from the rigidness of the current society, according to The Washington Post. These goals for the kingdom are a part of the “Vision 2030“ plan. Vision 2030 aims to turn Saudi Arabia towards a more moderate Islam, and create a city that runs on alternative energy sources and increase female participation in the workforce. The Guardian reported that Saudi Arabia still holds some of the tightest restrictions on females in the world. The country operates under an absolute monarchy that rules according to Sharia law. Sharia law, the BBC reports, is derived from the Koran and the rulings of Islamic scholars, or fatwas. In most public places, men and women sit separate from each other, the New York Times reported. Although changes continue to come for the women of Saudi Arabia, they still experience major restrictions. Women live under a “guardian” system in which they must receive permission to apply for a passport, open a business and travel outside of the country. How can I become more involved in this?